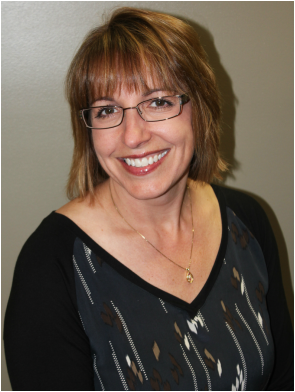 Dr. Angela (Cotter) Leonhard is a 1994 graduate of Indiana University School of Optometry and has been in private practice here in Columbia City since February, 1995. As a student at Indiana University, Dr. Leonhard served as an associate instructor in diagnostic procedures, was a member of the Fellowship of Christian Optometrists and served as a delegate for the American Optometric Student Association. She gained clinical experience in externships at the VA medical Center, Perry Point, Maryland and also at Randolph Air Force Base, San Antonio, Texas. Dr. Leonhard received the Kolac Award for Clinical Expertise and also the Indiana University Low Vision Award. Upon graduation, Dr. Leonhard spent 6 months in an ocular disease based residency program at the VA Medical Center in Chicago, Illinois. Dr. Leonhard is licensed by the state of Indiana in the practice of optometry and is also certified by the National Board of Optometric Examiners in therapeutic pharmaceuticals to treat and manage ocular disease and infections. Dr. Leonhard provides primary care optometry for patients of all ages. She is a member of the American Optometric Association and the Indiana Optometric Association.Prior to attending IU School of Optometry, Dr. Leonhard attended Butler University in Indianapolis, Indiana. She is a 1987 graduate of Jay County High School, Portland, Indiana. Dr. Leonhard is married to Michael and together they have four children. Hannah, Grace and Mary Cotter and Kendall Leonhard. She and her family are members of Faith Lutheran Church in Churubusco. Dr. Ingrid McClain received the Alcon Award for Clinical Excellence upon graduating from Indiana University School of Optometry in 2002. While at I.U. she served as an associate instructor in diagnostic procedures and gained ocular disease management experience during her externship at Bascom Palmer Eye Institute in Florida. She practiced for 5 years in Colorado and expanded her scope of practice to include binocular vision problems and vision therapy. Dr. McClain joined Columbia City Optometry in 2007. Dr. McClain has her therapeutics license in Indiana to treat eye diseases such as glaucoma, ocular emergencies and other conditions requiring therapeutic treatment. Although she provides eye care for patients of all ages, she continues to focus her training on children's vision development especially as it relates to reading problems. She performs school screenings for all first graders in Whitko Community Schools, Churubusco Elementary and Whitley County Consolidated schools. She is a member of the Indiana Optometric Association and American Optometric Association. After graduating from Whitko High School in 1994, she obtained her B.A. with a chemistry major for Hanover College. She and her husband Mike have three children, Moses, Mya and Matilda and reside in Whitley County. She is a member of St. Paul of the Cross Catholic Church in Columbia City. Dr. Ron Longenbaugh joined Columbia City Optometry in 2013. He has been practicing in Columbia City for 23 years. Dr. Longenbaugh grew up on a small farm just south of Warsaw, Indiana. He attended Indiana Institute of Technology attaining at B. S.in Mathematics in 1972. He worked in Fort Wayne in data processing and also taught mathmatics at Indiana Tech. from 1972 to 1982. Dr. Logenbaugh attended Indiana University School of Optometry, graduating in 1986. He has been in private practice in Columbia City since July 1986 to present, and lives just outside Columbia City. He has been married to Rita since 1970. Together they have two children, Nick who lives in Columbia City and Carrie who lives in Fort Worth, TX. They have one grandchild, Caleb, who lives in Fort Worth, TX. He and his wife have attended Trinity Evangelical Presbyterian church since 1986.